A high temperature, smooth, plastic, semi-vitreous, white to grey-white burning, ball clay:kaolin body for oxidation and reduction fired functional stoneware. H570 is less white and less vitreous than our other other porcelains. But it is better drying, less prone to warping in the kiln, easier to fit glazes to and potentially more consistent (because it utilizes three clays to minimize effects of individual changes). 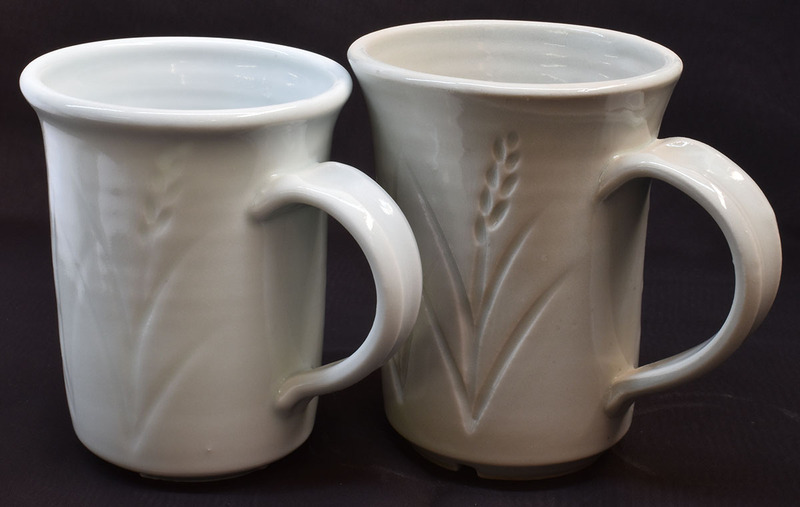 The combination of working and firing properties make it a very good choice for functional ware for the majority of people. 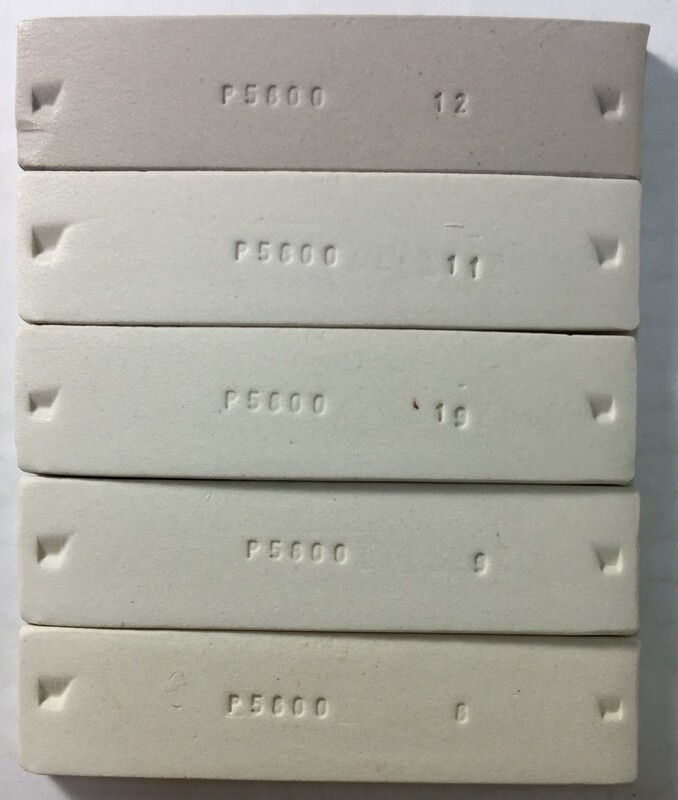 H570 fires whiter and throws better than other popular whiteware bodies manufactured in North America. It also generates less slip on throwing yet the surface lubricates well with water (there is less mud to clean up after use). Another key advantage is drying performance. Compared to a high ball clay body, H570 dries better and its dry strength is better. The reason for these behaviors is that it uses more kaolin and less ball clay than competing products (their ratio creates good particle packing). Common sense drying should prove successful using H570. Dry ware evenly, avoid letting any part of a piece become drier than another at any stage of the drying process. H570 fired bars. Cone 10R top. Cone 8 to 11 oxidation (bottom upward). Although H570 does burn white and speck-free, it does not reach zero-porosity at cone 10. However it does fire more dense in reduction than in oxidation. H570 has a fired surface and strength more similar to stoneware than porcelain and is thus better suited to firing conditions that are not totally consistent. Compared to vitreous stoneware or porcelain, lids will display less tendency to stick to the lips of containers during firing and overfired ware (or extreme shapes) will be less likely to warp, bloat, or glue themselves to shelves. However there is an important caution: H570 is quite high in free quartz. This is an asset to achieving glaze fit but also means that you should not cool the kiln through quartz inversion temperatures (e.g. 1000-1050F) too quickly or dunting cracks could occur (especially in large bowls and plates). You will note from the expansion curve (smooth at 220C 428F) that H570 does not appear to form significant cristobalite despite the fact that it is semi-vitreous. Remember also that cooling your kiln too quickly through any stage may set up temperature gradients within pieces that will continue even if you attempt to slow-cool during certain ranges. H570 will preserve bright glaze colors without the iron-bleeding problems associated with stonewares. However, if you wish to use glazes with earthtone shades, consider one of our darker burning materials. As noted, H570 is high in raw quartz (25% addition plus that in the 10% ball clay) and it is not vitreous. That means the quartz can impose the higher thermal expansion needed to prevent crazing in glazes (compared to our P600 and P700). However some competing popular whitewares can have 50%+ ball clay plus a 25% quartz addition. These formulations, although undesirable for various reasons, do enable people to employ very high feldspar recipes without crazing. If you are switching from one of these consider trying Plainsman P580 or contact us for help adjusting or adopting more balanced glaze recipes. H570 has some porosity so water penetration is demonstrated. Make sure your glazes are fitted to the clay by stress-testing ware (using the boiling water:ice water method) to bring out delayed crazing. You can find base matte and glossy glazes on our website. H570 vs. P700. Clear glazed. Cone 10R.